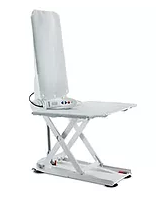 A bath lift is a portable device which is used to slowly lower and raise patients into and out of a bathtub. Bath lifts come with different options such as recline. These lifts come with a floating hand remote to operate them. A bath chair is a portable unit that can be used inside of a shower or bathtub to sit down on. They come in a variety of different models with different options such as arms or no arms, and a back or no back. 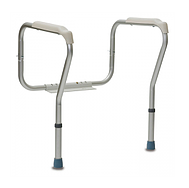 Grab bars are safety devices that are designed to assist a person with maintaining their balance or to use to stand up from a sitting position. These are a fixed item and require installation. Raised toilet seats are used to increase the height of a toilet or for stability getting on and off of the toilet. 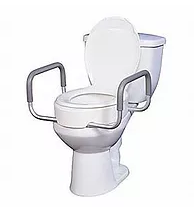 Raised toilet seats come in variety of different heights ranging from 2-5” and come with or without arms. A safety pole can be used in the bathroom or by your bedside and is mounted by pressure between the floor and ceiling. This pole provides vertical support with the option of horizontal support if a super bar is added. 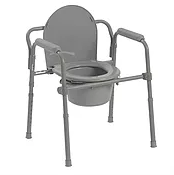 Shower commodes can be used beside the bed or inside of a walk-in tub or shower. They have different options such as tilt, and drop arms. 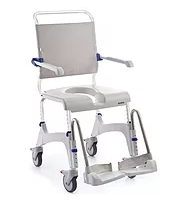 Commodes are a stationary item that can be used beside the bed as an alternative for the washroom or they can be used over a toilet to give added support. They are adjustable in height and are easy to adjust and transport. 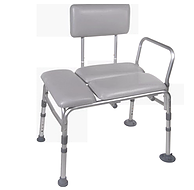 Transfer benches are used to assist someone with bathing and to minimize the risk of slipping or falling. They are available in padded and non-padded models and are adjustable by height. Tub clamps are used to assist someone in getting in and out of their tub. They clamp to the outside wall of the bathtub and they are adjustable in height. A versa frame is bolted to the back of a toilet and provides arms for someone to use when using the toilet. They are adjustable in height to fit most standard toilets.